Scientific name: Echinacea purpurea. The word “Echinacea” is derived from the Greek word “echinos” which means hedgehog, referring to the appearance of the spiny seed head. The word “purpurea” is derived from Latin for “purple-red”. There are various species of Echinacea that are used medicinally: Echinacea purpurea (purple coneflower), Echinacea pallida (pale purple coneflower), and Echinacea Angustifolia (narrow-leaf coneflower). However, this article covers the most common Echinacea purpurea. Echinacea contains a variety of phytonutrients such as aromatic essential oils, polysaccharides, lipophilic alkamides and antioxidant flavonoids. These phytonutrients help in the stimulation of immune system functions and enhancement of cell signaling. Echinacea also contains glycoproteins that help in efficient digestion and cell structure. Echinacea works by stimulating and increasing the production of white blood cells in the body. White blood cells are your antibodies, your body’s first defence system to fight infections. It contains a compound called echinacein that inhibits pathogens from penetrating healthy cells, thus reducing the chances of any infections taking over. According to a meta-analysis published in the Lancet Infectious Diseases journal, echinacea does boost the immune system and is highly effective in reducing the duration of the common cold. In fact, it can cut the duration by almost a day and a half. However, it is only effective when taking it at the very first signs of a cold. It is unlikely to do much when taking it once a cold is full-blown. 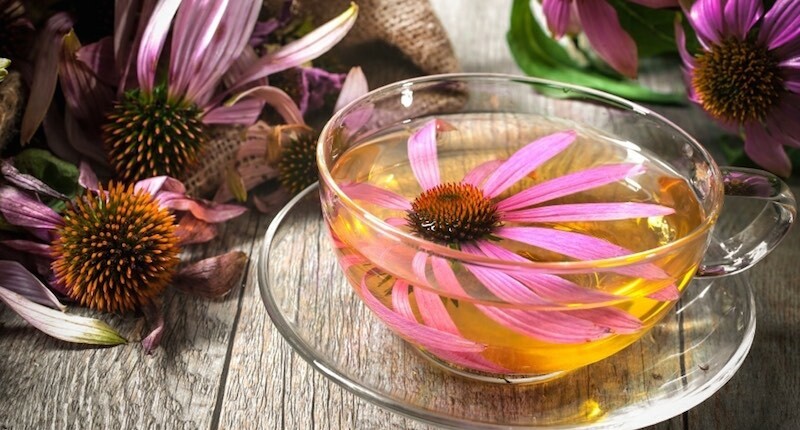 Taking echinacea decreases the chances of catching a cold by 58 percent. It is also worth noting that research shows that the immune-boosting quality of echinacea is dependent on dosage. A daily dosage of 10mg/ kg weight over a ten-day period has been found to be optimum. Echinacea has been used to alleviate pain for a long time. In fact, the Great Plains Indians used it as a painkiller. It can be taken in the form of a herbal tea to combat pain caused by snake bites, sore throats, toothaches, measles and even gonorrhea. Making a poultice from the herb and applying directly on affected area is also a great way to reduce the pain and inflammation. Currently, there is also extensive research into the potential use of echinacea to combat pain caused by knee osteoarthritis. According to a study by the University of British Columbia, regularly consuming echinacea can alleviate and even reverse inflammation. This is really good news to the many people across the globe suffering from inflammatory conditions such as rheumatoid arthritis. Research shows that echinacea is useful for the early treatment of acute upper respiratory infections. 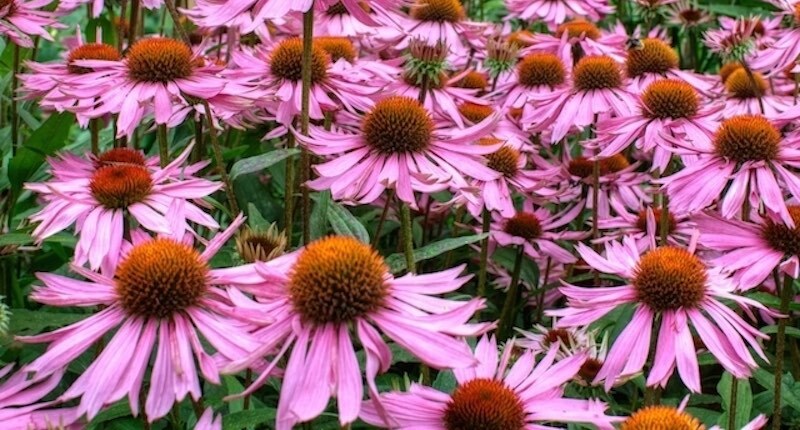 Some of the upper respiratory infections that echinacea helps with include laryngitis, bronchitis, whooping cough, acute sinusitis, diphtheria, and strep throat. It helps by reducing the irritation mucus deposition in the tracts, and speeds up healing. For remedy of these ailments, taking echinacea in capsules or tincture provide the best effect. Another health benefit of echinacea is its ability to act as a natural laxative. A study by the Medical Herbalism journal found that an echinacea dose of 8 grams provides relief to a person with constipation. This is where echinacea herbal tea comes in especially helpful. Echinacea provides a calming effect to the gut, while at the same time helps to loosen bowels for elimination. Drinking 2-3 cups of echinacea tea a day may help resolve this issue. There is evidence that echinacea promotes the increased production of red blood cells, therefore, leading to an increase in the blood’s capacity to transport oxygen. This means better blood circulation that will benefit the heart and the body’s muscles and arteries throughout the body. Proper blood circulation ensures better nutrients distribution throughout your body, reducing the chances of limb numbness, improved brain functions, better skin health and definitely reducing the risks for any health complications. Echinacea when used in combination with other herbs like sage, lavender and mastic gum, can alleviate bad breath and gum disease. This is due to echinacea’s ability to get rid of the organisms that cause trouble in the mouth. Those that have dry or wrinkled skin will be happy to know that Echinacea provides a natural solution to these problems. In fact, a study found that echinacea cream and gel reduce wrinkles by 9.47% and 14.92% respectively. Additionally, these products don’t cause any irritation to the skin. They, however, can’t be stored for a long period due to their active ingredients. When regularly supplementing with echinacea, you may also notice that it speeds up your wound healing process, in cases of surgery or wounds. It speeds up the formation of new skin, eliminates bacteria and prevents infections. This may be useful for individuals who has slow recovery of wounds such as in diabetics. Individuals suffering from minor to moderate skin problems may also find some relief, as in the cases of skin inflammation, psoriasis and eczema. There has been some interesting research into the use of echinacea for combating cancer. In fact, a study states that the phytochemicals present in echinacea may be used to combat tumors. It works by stimulating the body’s immune system to prevent the development of cancer, and eliminate cancerous cells. Another attractive quality of echinacea is its ability to promote the healthy growth of cells. This has been proven by several research studies such as this National Institutes of Health (NIH) one. This herb is available in many forms ranging from capsules to liquid form. Capsules: Capsules are made from the dried plants which may reduce the efficacy of the active ingredients. You may need to take a higher dosage by capsules. The tincture form is much better to fight a cold. Tincture: Echinacea is much more potent in its liquid form. To shorten a cold duration, use the tincture. Tincture can also be applied on wounds to prevent infection and speed up wound healing. If you have a sore throat or strep throat, squirt tincture directly on the back of your throat every hour until symptoms subside. Tea bags: Always have some echinacea tea bags handy. Drink echinacea tea on a regularly basis to boost your immune system, especially if you tend to catch a cold around the time when the seasons change. While echinacea doesn’t usually have any side effects, if you are on any medications, it is best to discuss with your doctor before you start taking echinacea in any form. Due to its potency, some people may complain of dizziness, headaches or a rash. Always start with a small amount and gradually work your way up. Although the echinacea herb is great to boost your immune system, it is “unnecessary” to take it all year round. Herbalists suggest that you take it only when you feel that your immune system is low, when you have been in contact with sick people, and immediately when you feel the first signs of any symptoms. Although there isn’t enough research to prove that this herb is unsafe for children, pregnant mothers and breastfeeding mothers, it is advisable they stay clear of it.